Locked out of your home, business or automobile? Did you lose or misplace a key? We understand that emergencies can happen. Our response to any lockout situation is quick and efficient. At Rhodes lock and key our top notch emergency service experts have over 20 years of experience. Unlike many of our competitors we have a reputable locksmith shop which is fully licensed and insured. Your well being and security is our number one priority. 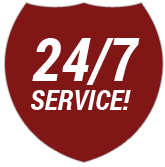 Our certified technicians are on call 24 hours a day, 7 days a week in order to better serve our customers. Simply put, we are the best in business in any emergency situation. Call us today.